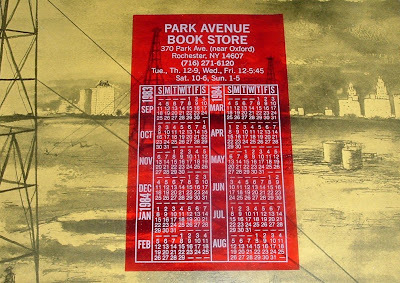 Here's a curious pairing of bookmark to book: A Park Avenue Book Store calendar found in Houston: Land of the Big Rich, by George Fuermann (Doubleday, 1951). 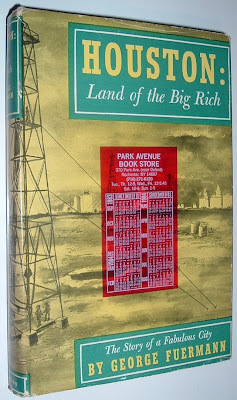 At first glance, you'd think the book about the big rich in Houston was marked by a transparent red calendar for a bookstore in the Big Apple: Land of Some Really Big Rich. But this Park Avenue is found in Rochester, New York, not NYC. The calendar is circa 1983/1984, the two years printed on it. Tracking that 25-year-old clue, about all I can find presently is a mention from Peggy Rosenthal in the acknowledgments for her book Words & Values: "Herb Leventer, whose Park Avenue Book Store has become a sort of personal research center for Rochester's many writers and avid readers..."
So the bookstore with the big-city name appears to have been a literary hangout for its city. And it likely went the way of so many other once-viable book places. I had hoped to find it still thriving as an independent centerpiece of Rochester's literary community. They're a dying breed. Even in the land of the big rich. But wait... Rochester's bookstore community appears to be alive and well. Read about it here. Aside from the big chain store, there are a fair number of smaller independents staking their claim for the readership of Rochester. I'd call that the Big Enrich. Here's an invoice from 1955, W.M. Morrison - Texas Books. Morrison (1914-1981) was a collector, bookseller, and Civil War historian. He was also a publisher of reprints and original works of Texas history. In 1963, Morrison published Texas Book Prices (updated in 1972). During his carer, he issued 340 catalogs, which have in themselves become collectible for their bibliographic and reference value. More associated with Waco, he opened his first book shop in Houston in 1954. 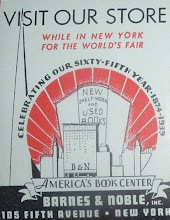 Herbert Fletcher (Anson Jones Press), whom I've blogged about, was a mentor to Morrison. A year later, as indicated by this invoice, he sold an interesting book that's now part of my stock: Park Hill, by Carolyn Thomas Foreman (1948). 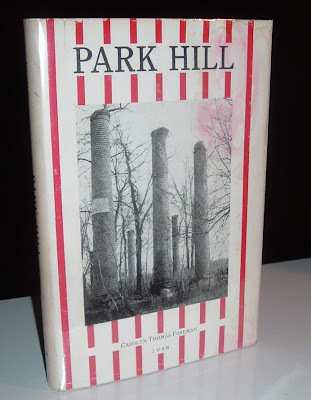 Park Hill is a scarce title dealing with the town that became a publishing center of culture and historical research pertaining to Chief John Ross, the Cherokee Nation and the Trail of Tears, and the Oklahoma Territory. The book was sent to a customer in Oklahoma City in 1955 and somehow found its way back to Houston, where I found it more than 50 years after Morrison sold it. Morrison included a note on the invoice asking the buyer know to contact him if he ever ran across a photo of Chief John Jolly, as he'd like to obtain a copy. John Jolly was a Cherokee Chief in Tennessee, known as Chief Oo-loo-te-ka. He may be better known for adopting Sam Houston as his son. Houston went to live with the Cherokee as a young man and Chief Oo-loo-te-ka adopted him as his son, naming him Co-lo-neh, or the Raven. Later, Houston acquired the much less flattering nickname of Oo-tse-tee Ar-dee-tah-skee, or "Big Drunk." The link above for Chief Oo-loo-te-ka includes an engraving that apparently depicts Oo-le-te-ka and Sam Houston. As Oo-le-te-ka is reported to have died in 1838, no photos will exist for him. This image may be the only one or one of only a handful that depict the chief. Turning to my copy of Engraved Prints of Texas 1554-1900, by Kelsey & Hutchison (Texas A&M University Press, 2005), I learn it's a wood engraving by J. Dallas that was one of several included in the biography, The Life of Sam Houston, by Lester C. Edwards (J.C. Derby, 1855). One last item of interest on the invoice is Morrison's membership list in societies pertinent to his business. No less than a dozen are listed, including the A.B.A.A., The Manuscript Society, and the Texas State Historical Association, to name several. Like a good reference library, society memberships can be used to further one's knowledge in areas of interest. Morrison knew that early on in his career. 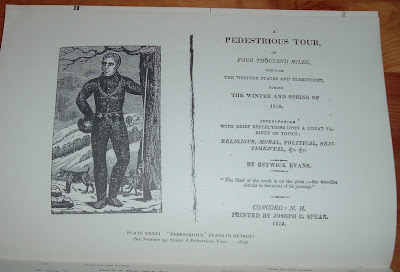 Without my reference books (Morrison's Texas Book Prices is in my collection), I could not have produced so quickly, if at all, the information I just presented about the wood engraving. 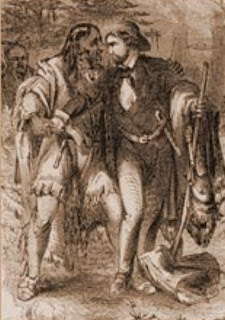 And without adding Mr. Morrison's invoice to my bibliophemera collection, I would not have learned a few things about him, Chief John Jolly and other Cherokee history. All fine things for a bookseller's knowledge collection. I recently purchased a couple of books dealing with Michigan history. The ephemera angle for this blog post comes into play in two different ways. One book could actually be called ephemera; it's a paper-bound library catalog of rare books pertaining to Michigan's history. 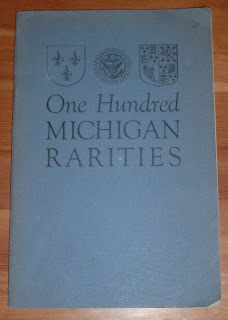 Its title is One Hundred Michigan Rarities, published as Bulletin LX (revised from Bulletin XXVII) by the Clements Library in Ann Arbor, 1950. The other is a hardback book about Michigan history in the era of President Grover Cleveland. 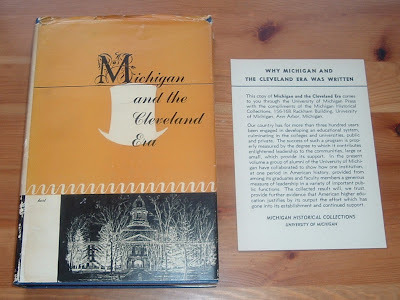 Inserted inside the book is a promotional piece of ephemera titled Why Michigan and the Cleveland Era was Written. This is of more interest to me than the book because it led me to an interesting site where I learned about the Michigan Historical Collections housed in the Bentley Historical Library at the University of Michigan. Here you'll find a treasure trove of historical ephemera--more than 4,500 archival collections, 65,000 printed works, over 10,000 maps, and nearly 1.5 million visual images (including photographs, negatives, films, and videotapes). The collections comprise all periods of Michigan history, drawn from all 83 of its counties, from early exploration to present. Back to the library catalog... 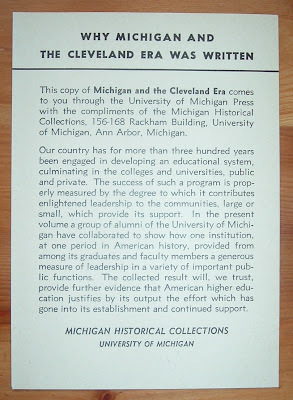 The three shields, or crests, on the cover of the catalog depict the three eras associated with Michigan's history and the catalog's corresponding content. First up is the era of French rule over Michigan, up to 1763. The arms of France with the three fleurs-de-lis depict this era. France was the first European country to claim by exploration and colonization that part of North America which is Michigan. 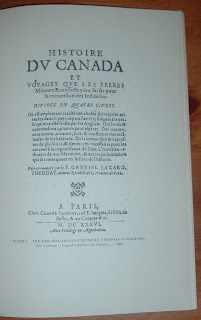 Samuel de Champlain reported the existence of the Detroit River as early as 1603, though apparently he never reached Michigan; Etienne Brule visited the present area of Michigan in 1622; Jean Nicolet attended a banquet in Michigan in 1634; fur traders crept into the virgin land; missionaries carried the cross to the Indians; settlers and traders established homes. 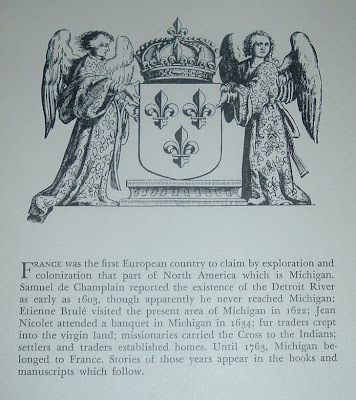 Until 1763, Michigan belonged to France. Stories of those tears appear in the books and manuscripts which follow. [Right plate above] 11. JACQUES BELLIN. La Riviere du Detroit Depuis le Lac Sainte Claire jusqu'au Lac Erie. Paris, 1764. 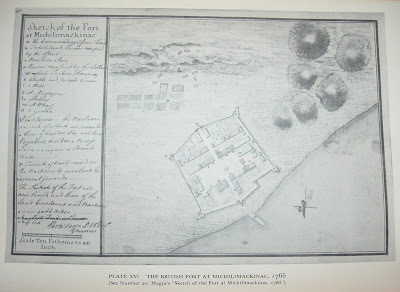 Bellin's famous map of the Detroit River was based upon surveys made between 1749 and 1755 by Chaussegros de Lery, a French engineer stationed at Detroit. 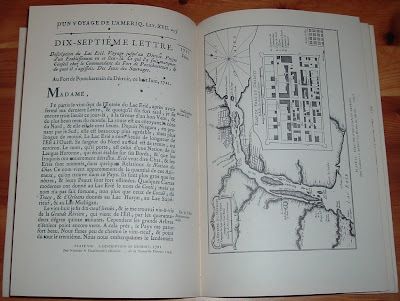 The inset "Plan du Detroit" is the first printed plan of the city. The map was published in Bellin's Le Petit Atlas Maritime, Paris, 1764. [Plate IX in the catalog] The Royal Arms of Great Britain introduce the second era of Michigan's history represented in the catalog. 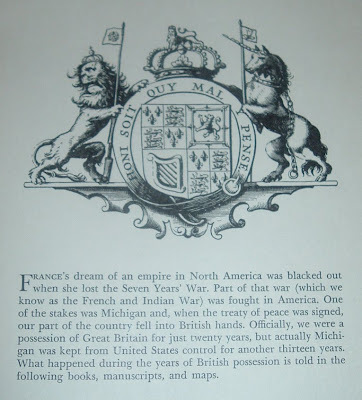 France's dream of an empire in North America was blacked out when she lost the Seven Years' War. Part of that war (which we know as the French and Indian War) was fought in America. One of the stakes was Michigan and, when the treaty of peace was signed, our part of the country fell into British hands. Officially, we were a possession of Great Britain for just twenty years, but actually Michigan was kept from United States control for another thirteen years. What happened in the years of British possession is told in the following books, manuscripts, and maps. Twenty one examples are cited, two of which are shown below. The United States: Michigan's third and last owner. 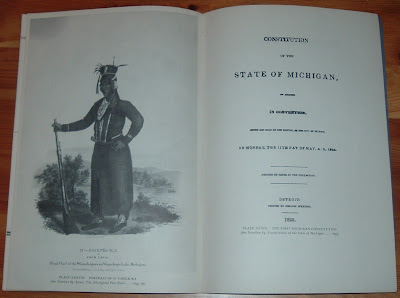 Michigan was ceded to the United States in the Treaty of 1783 and thus passed to its third and final owner. But Great Britain was reluctant to give up her strong posts on the frontier. Not until 1796 did she finally relinquish her hold on Michigan. The years since 1796 are many and so are the changes Michigan has seen. 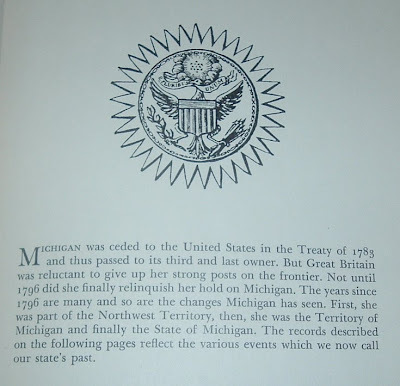 First, she was part of the Northwest Territory, then, she was the Territory of Michigan and finally the State of Michigan. The records described on the following pages reflect the various events which we now call our state's past. Items 63 and 64 below offer a sampling of Michigan's history after it was turned over to America. 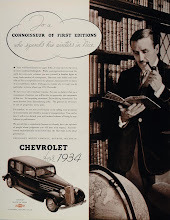 Fine Books & Collections has a feature this month on Michigan bibliophile William L. Clements and the library named for him (he was the benefactor). 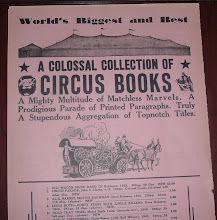 A recent purchase of an old Goodspeed's catalogue turned up a few pieces of related ephemera tucked inside the cover. 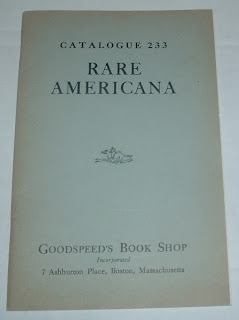 Catalogue 233 - Rare Americana. 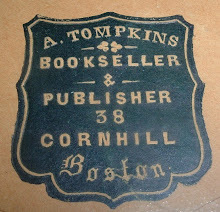 Goodspeed's Book Shop at 7 Ashburton Place in Boston. 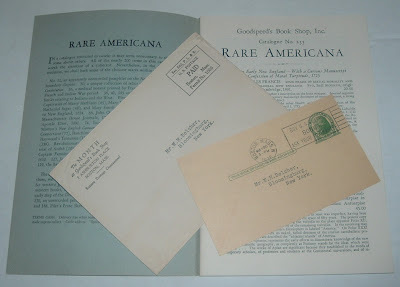 The catalogue is not dated, but a postcard inside indicates 1936 was the year. In a recent post, I referenced Goodspeed's publication, This Month at Goodspeed's. So it was particularly nice to find an envelope representative of what they were mailed in. None of the copies I've collected (some 100-200 publications) have a mailer with them. 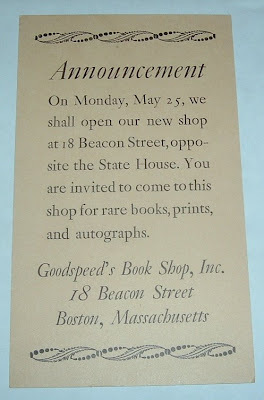 This is also the year that Goodspeed decided to leave the Ashburton address and open up shop at 18 Beacon Street. 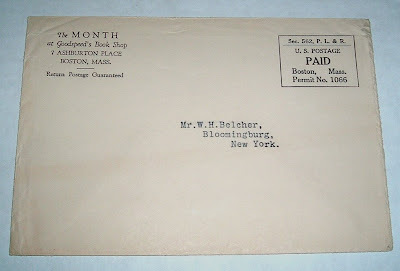 Included in my Goodspeed ephemera was a postcard announcing the move. 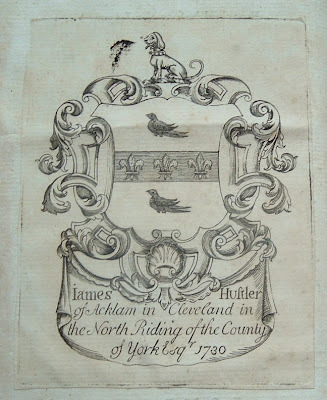 Here is the bookplate of James Hustler. 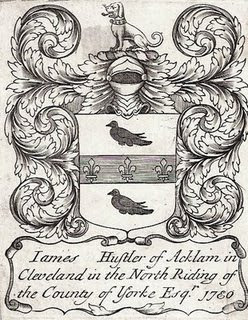 More precisely, James Hustler of Acklam in Cleveland in the North Riding of the County of York, Esq. The bookplate is dated 1730, which I think makes it the oldest in my small collection. 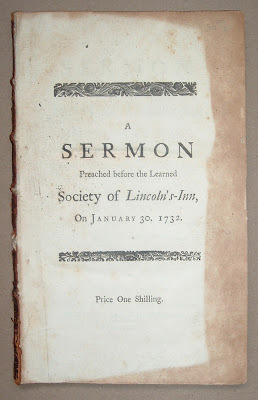 It's affixed to the backside, or verso, of the title page of a slim 51-page volume, sans covers, titled A Sermon Preached Before the Learned Society of Lincoln's-Inn. 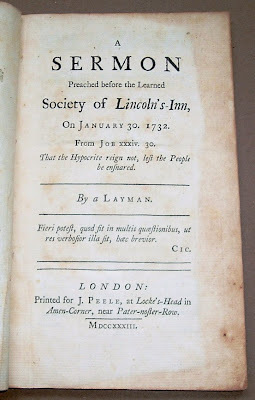 The title page allows that the sermon was preached on January 30, 1732, by a Layman. The price of the book was one shilling. All that's left of the book's binding is the spine--a thin strip of cracked leather, with remnants of gilt and raised bands, clinging tightly to the leaves by antique threads (I wish the covers' hinges could have boasted the same durability!). But the ex libris of the distinguished Hustler fares well almost a score shy of three centuries. de Braganca refers to another Hustler bookplate with the same inscription, but in Jacobean style. I wouldn't know Jacobean from L.L. Bean, but I can see the differences between the two bookplates. I'm unclear if Jacobean refers to the typeface of the inscription or the overall design of the bookplate. I'm borrowing a copy of de Braganca's Hustler ex libris to display alongside my copy so the differences between the two may be more apparent. I am no scholar of ex libris, as is de Braganca, so I'll refrain from attempting to describe what I see. I urge anyone interested to visit the de Braganca post to learn more. What the two versions have in common are the dog, birds, the three fleur-de-lis, and the inscription. The inscription is positioned in a slightly different manner, but the same words are all there. What's different is what is missing on each. My copy includes a shell-like emblem just above the inscription; de Braganca's copy does not. And de Braganca's copy includes, just below the dog, the head gear of a suit of armor; my copy does not. Both copies include a decorative border, but they are noticeably different. The book that bears James Hustler's ex libris infers that James Hustler belonged to the Society of Lincoln's Inn, one of the Inns of Court in London where barristers of England and Wales belong when they are called to the bar. This historic Inn of Court traces its history through official records back to 1422. Armorial bearings decorate, as well as commemorate, past members of the society. There's no mention of James Hustler on the society's Web site, but I have to think his would be included. Names famous in the law naturally feature among its benchers and members, such as Sir Matthew Hale and Lord Mansfield, Chief Justices of the King's Bench in the seventeenth and eighteenth centuries or, more recently, Lord Denning, but it has also served as a training ground for those whose achievements were in other fields. Fifteen Prime Ministers, from William Pitt to Tony Blair, have been benchers. In about 1979, a portrait of several members of the Inn, including Margaret Thatcher and Lord Hailsham, who at the time each held one of the great offices of state or high judicial office, was commissioned and is on display in the Inn. The names of the novelists Charles Reade, Charles Kingsley, Wilkie Collins, Rider Haggard, and John Galsworthy are all found in the membership records. The poet and preacher John Donne was Preacher to the Society and laid the foundation stone of the present Chapel, built in 1623. Thomas More, the author, humanist scholar and statesman, was admitted as a student in 1496 and went on to become a bencher of the Inn. James Hustler is in some pretty impressive company. The mention of John Donne being Preacher to the Society prompted a quick check of his life span to see if he could have been the preacher at the time of the sermon that comprises my book with the Hustler bookplate. No such luck, Donne died in 1631. But I did find a list of Preachers of Lincoln's Inn, a clerical office in the Church of England, whose past members include, in addition to Donne, William Warburton, Henry Wace, Derek Watson, and Edward Maltby. Of these four, William Warburton fits the timeframe for having preached at Lincoln's Inn at the time of the book's publication. Although the author of the sermon is indicated as a Layman, sometimes there was a reason for anonymity. The National Library of Australia has a copy of the sermon that credits Thomas Gordon as the author (Cato's Letters). So amid some uncertainty over the sermon's author, there's little doubt that James Hustler owned a copy of it and his bookplate is all the proof necessary for that conclusion.